The old part of Seoul near Kyongbok Palace always seemed soothing and energizing despite the traffic. In the late 1980s and the 1990s, you could walk along the walls surrounding Changyong Palace, under the closely trimmed sycamore trees and past the tiny parks which are so welcome in a huge city, and then up crooked, narrow little streets of ancient houses and little shops to Lotus Lantern International Buddhist Center. The center has since moved to Ganghwa near Incheon City. Many things happened at the center—meditation classes, classes in Buddhist teaching, some with an eye toward improving people’s English, regular services of chanting and 108 bows, dharma talks on aspects of the teaching, traditional Korean tea ceremonies, monthly pot-luck dinners, publication of books and a newsletter, a big celebration of Buddha’s Birthday, and workshops on things ancient and modern. It was squarely in the middle of the crossroad between East and West, with a great deal to offer people from both. Just before its fourth birthday, two branch centers were established in Russia. In 1992, I met with one of the center’s co-founders, Michael Roehm, an attractive, energetic man in his forties. Michael was leaving Korea after a tenure of almost ten years. We sat in a comfortable coffee shop drinking coffee and listening to recorded jazz being played softly in the background. One of the things that makes Lotus Lantern interesting is that it exists at a cultural intersection. It’s unique in Korea—and even unique, as far as I know, in most Buddhist countries. It’s a center that is deliberately not a temple, where you have innovation and new ideas existing in the setting of a very old, xenophobic tradition. Therefore it is highly unusual, and so far still an experiment. They gave up the idea, wisely. Then they came up with the idea of a center. With Brian Barry as the other layperson, there were four of us who thought there was no place in Korea which could provide foreigners with reliable and helpful information on Buddhism and also give foreign Buddhists a place to come to—and Koreans who were interested as well. So we got together in a coffee shop, and we started to flesh out the idea. We needed a name. I thought the name should be concrete and should have an image, like a wind-chime, but distinctly Korean. Brian came up with the name Lotus Lantern. In those days Wonmyong Sunim was working full-time as part of the Chogyesa headquarters hierarchy. He’s very well liked, and he knows a lot of people. He talked with lay supporters who provided the rent money. Mujin Sunim jumped into it, and we looked at a lot of buildings and finally found the present building. By virtue of circumstances and her own personality, Mujin became the manager of the place. She was the only full-time person, and she had a modern sense of order and of what needed to be done. Then eventually Dogong Sunim came from another temple, to some extent Chikwan Sunim also got involved, and a yoga teacher offered to teach classes after going to India for more training. The concept we discussed in the coffee shop was that we wanted to set things up in such a way that Lotus Lantern was not dependent on any one individual. That proved impossible. Both of the clergy are indispensable, and it turned out that neither of the laypeople could devote as much time to the place as we had thought. After two years we abandoned the idea of rotating the courses so that all of us could teach everything. Dogong Sunim took over the meditation classes and the Exploring Buddhism classes. I took the sutra study. I got out the World Almanac and wrote to every non-Christian group I could find—the Bahai, the Jews, the Unitarians, and the Buddhists. The first response I got was from a Buddhist group in California. They sent something on the Four Noble Truths. [These are usually translated as the following: life is suffering; suffering comes from desire; suffering can be overcome; follow the Eight-fold Path.] At thirteen I was not ready for that. I thought it was awfully pessimistic. The Unitarians sounded nice, so my mother and I went to one of their meetings. We were living in Ben Avon, a suburb of Pittsburgh, and we went trooping through a snowstorm over to the East Side for a meeting, which was rather dull. Gradually Judaism and Bahaism were also eliminated. Then I got some books on Buddhism. Christmas Humphrey’s Buddhism had just come out in Penguin paperback. It had the address of the Buddhist Society in London, so I wrote to them, and they put me in contact with some Buddhists in Philadelphia. I came to Buddhism that way. 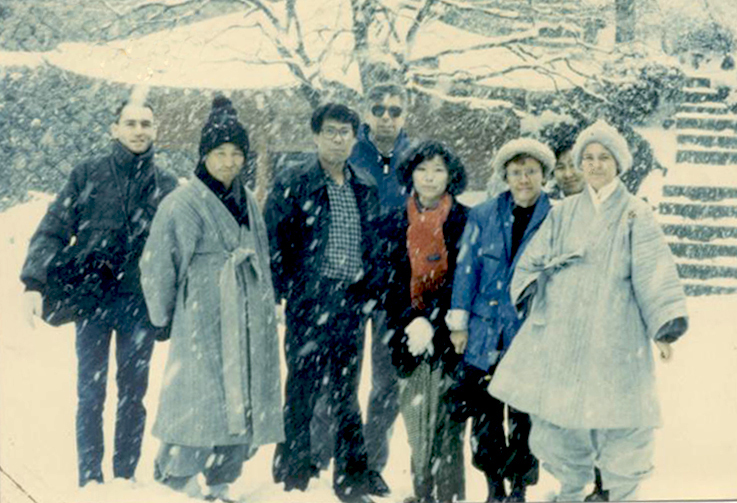 Later when I went to American University in Washington, DC, I met other Buddhists. My first meditation teacher was Thai, and my first dharma teacher was Sri Lankan. At that time I was doing some reading on Buddhist philosophy and allowed it to interfere with my practice. It’s common for people to get hung up on the articulation of something rather than doing it. You read so much it mucks things up for you. Then in 1979 my mother died quite suddenly, and my family responsibility was gone. I decided to go to Sri Lanka and become a monk—full of the romance of it. However, before I left I met a Korean Zen master from Songkwan Temple named Kusan Sunim, who gave a talk at Washington Buddhist Vihara. I spent the whole week driving him around the area and looking after him. When I found out that he was going to have a retreat in California, a friend and I went out there for it. In Sri Lanka I was ordained in the very conservative, rule-bound Theravadan tradition. I was not favorably impressed with the teacher I had. So when the death of a family friend called me back to the States, I stopped in Korea to see Kusan Sunim and a couple of Westerners I’d met in the States. In Songkwansa there were some Westerners to talk to, real meditation practice, and Kusan Sunim himself was a great inspiration. He was quite extraordinary. He was a traditional mountain monk, a Zen practitioner who put aside all concepts and just did meditation, living in the mountains away from all involvement with society. It was extraordinary for a monk to be so open to foreigners, to want them to practice with him and to be constantly promoting and defending them. There is no other mountain monk in this country who is open like that. So I stayed. I took Korean ordination on top of my Sri Lankan ordination. My confusion about practice lifted. Kusan Sunim had me working with a different method, the hwadu. Hwadu practice is by far the most prevalent practice among monks and nuns in the Korean Zen tradition. This is a practice of constant questioning, similar to the koan practice of contemplating paradoxical riddles and having the same purpose, to break outside the bonds of left-brain, linear thinking. The hwadu might be a question turned back on the questioner, such as “Who is it that is sitting? Who is it that is walking? Who is it that is calling the Buddha’s name?” Or, as in my own case, the hwadu might be an unanswerable question that has arisen from the practitioner’s personal experience. The Zen people in Korea have a very good attitude about reading things on Buddhism. You read your sutras or you read your books, and you put them over there, and you go sit. You forget them. What’s of value has been absorbed. The founder of Songkwansa, the National Master Pojo, developed a method in which meditation and reading the sutras are balanced so that they keep feeding each other. A number of his awakening experiences occurred after a period of intensive meditation, when he’d gone back to a Chinese text and then all of a sudden—click—one word or one sentence would light up, and that was all it took. That’s the purpose of the sutras. They’re not creedal documents, they’re not philosophy, and they’re not novels. They’re supposed to guide your practice. If they do, certain things will go just like snapping your fingers. If you don’t have that experience, go read a murder mystery. Kusan Sunim died two years later. His successor was not a great meditation master. The value of coming to sit under someone great was gone. Everything fell apart. Of the old group only Chikwan Sunim is left. Being a monk or a nun here is very difficult for a Westerner because of the xenophobia in the temples. Passing through is fine, but people don’t want foreigners as part of the operation. In Korea adjusting to the conflict between Western society and Asian society is a much bigger problem than in Sri Lanka or Thailand because of the Confucian element. Those societies are much more open, more flexible. And at Songkwansa we were in traditional Korea, not in Seoul. For me on top of that was the fact that I’ve never been a perfect fit for mainstream culture to begin with. I’ve always been on the side—one foot in, one foot out. There was a conflict of things that all came together that I couldn’t resolve. All my real training, apart from meditation, had been as a Theravadan monk. I was wearing the robes of a Mahayanan order, but I didn’t really feel I could wear the robes of either one. Eventually, I went back to the Pali sutras and discovered that I am really a Theravadan, but with a certain looseness. I reoriented myself, and certain Buddhist problems disappeared. The question of whether to remain a monk or not was a separate issue with a different set of problems. I said to myself, “OK, being a monk now is not the right thing, drop it.” I think now leaving the order was a good thing, instead of running back to Sri Lanka or staying a monk somewhere in Korea, but there’s still a fifty percent chance that I will ordain again because I have a monk’s mind. I also decided that I liked Korea very much, in some ways much more than Sri Lanka. I didn’t want to go back to being an academic bureaucrat in America. In Korea all I could do was teach English because everything else was closed to me. I taught in a language school for a while, then went to the company language school at Daewoo, then to London for the Royal Society of the Arts certificate in TESL [Teaching English as a Second Language], then back to Daewoo. I stayed on for six years. Teaching at Lotus Lantern has been very beneficial for me because it has forced me to go deeply into the sutras rather than just read them. The Buddhist sutras are really transcriptions of oral literature, so they show those characteristics—excessive repetition, stock phrases, mnemonic devices and so on. The repetition is not just for aesthetic purposes, as in a symphony, but to drive home a point. It drives Western people nuts. The translations from Pali and Sanskrit are a problem. But there are also big cultural barriers. In the Indian culture of the time, educated people were expected to be able to versify spontaneously, so in the sutras, people will suddenly burst forth into verse—which strikes us as totally improbable. Indian culture is also excessively verbose, causing one of my students to ask, “Why do they use twenty words when they only need one?” But the thing is, within the tradition of Indian literature, the Pali sutras are very lean. In Sanskrit there would be sixty words for the twenty in Pali. Sanskrit literature is cluttered beyond belief—full of literary allusions and multiple adjectives and hyperbole gone amok. Yet at the same time, you’ll be reading, and all of a sudden—wham—you’ll be hit, not by the whole thing, but by a golden thread piercing through your consciousness. Given the function these texts are supposed to serve, you read them, you go and practice some more, you have more life experiences and come back and read them again, and you see things you never saw before. Because the meaning is not simply in the text and not simply in you, but in that horizon or fusion between the two. There are certain sutras that I will go back to regularly, after a period of two months or two years, and all of a sudden I see new things and gain new insights. I learned in Korea that proper practice is a combination of formal practice—sitting meditation, walking meditation, everyday mindfulness—and study. Practice and study should be interrelated almost in a dialectical development. After almost ten years I’m going back to the United States very much changed, in many ways, and Lotus Lantern has been an important part of that. The time has come for me to go—due to a variety of reasons, getting my own house in order and changing what I’m doing. The time is right, but I’m leaving reluctantly. I’ll visit regularly because this country has become part of my blood. When I get back to the States I want to be more oriented to Buddhist work, if not completely involved with it. Michael started a Pali Canon sutta class over ten years ago. I was one of his students. I recently put up a web site for this class. I am interested in linking our site to your article about him. May we have your permission to quote parts of your article and if so, how much may we quote? May we use the picture too? Sure, help yourself. Just credit this website, please. You may also want to contact Michael via Facebook. Thanks for the interesting article. I knew vaguely that he was a monk in Korea, but I did not know that much of the story.